There's a decent enough photo viewing app on the TouchPad. But that's what it is - decent. Sure, you can run a slideshow on it, but what about putting in music, changing the display order, and including captions for each photo? Well, that's where an app like the recently over-hauled Slideshow Presentation HD comes in - you can do all that and more. Transitions? It's got twenty-five. Zoom settings? Stretch or fill, even on a per-image basis. Want to do individual folders, or even files? Yep, it can do that. How much would this cost you? Normally it's $0.99, but we just so happen to have 100 copies to give away to you, dear readers. 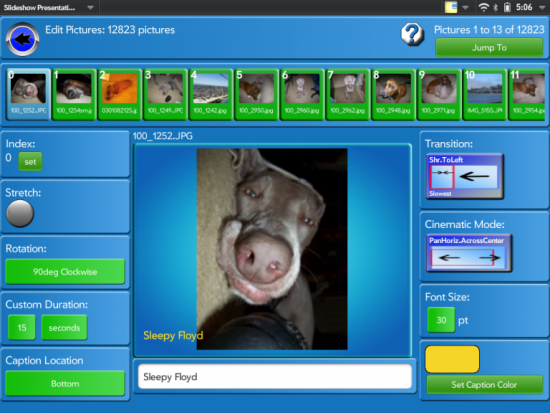 Contest: We have 100 copies of Slideshow Presentation HD to give away. Just leave a comment on this post to enter. Contest ends next Sunday at midnight US Eastern Time, after which time we will select 100 random entrants to win. Please only leave one comment, multiple entries won’t count. Promo codes are only valid in countries serviced by the App Catalog, and users must be running webOS 3.0.2 or higher with the latest version of the App Catalog.